If you’re looking for ways to save money in your monthly budget, but still would like to have lots of garden plants, here is one option – Cuttings. Early Fall is a great time to start this process. Don’t wait until later as the plant physiology starts to change and you’ll have less success with the cuttings. Buy a soil-less potting mix, rooting hormone, Osmocote and a seed germination tray from your local garden supply store. If you can buy an extra bottom tray that would make it easier and safer when moving the trays around. I prefer the trays with 36 cells per tray. You don’t want soil, but a potting mix without soil. I prefer BX Promix since this is what professionals use. It’s more expensive and can be hard to find. I am doing not only doing a tour of my Butterfly Gardens, but also teaching a class on how to propagate plants by cuttings. We’ll be using my Miss Huff lantana for cuttings, so bring a cutting device and a glass/plastic container so you can take the cuttings home. Tom is doing a free class on collecting seeds and making cuttings to help increase your plant population in 2018. No need to signup – just park at the school across the street. 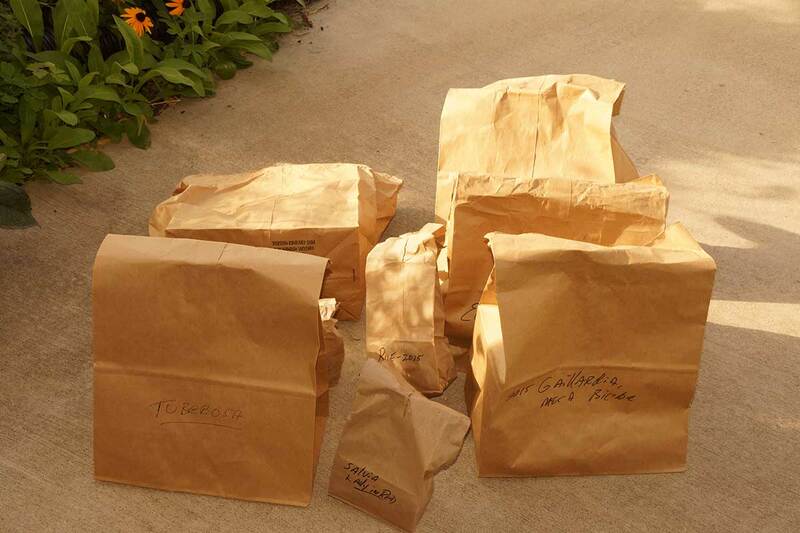 Paper lunch bags for seeds. Small pots, clear plastic bags and potting mix for cuttings. 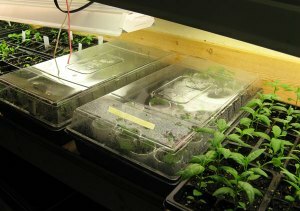 I have started seeds indoors for many years and have pretty good success. The problem I always have is that the plants get tall and have weak stems and don’t do as well as I’d like when they go outside. Mary Ann Fink has given me a number of suggestions which should help. Pinch the end of the plants when they get two or three sets of true leaves. This will encourage the plant to send out lateral shoots and be bushier instead of just tall. Use an oscillating fan to push the plants back and forth. This will encourage them to make their stems sturdier. Finally, give them a pat on their tops. This is supposed to keep the plant smaller and sturdier and not quite as tall. Another tip I have learned from a plant propagation class is that when you want to harden the plants off, you need to reduce the watering of the plants. You want them to dry out between watering. If you haven’t already, now is the time to start saving seeds and then start their period of cold-stratification. Shaw Nature Reserve has a nice PDF on this process and how each species is slightly different. I’ve already done a detailed report on the process that you can find here. I’m going to test their three month refrigeration process against leaving seed outside in pots and see how Mother Nature compares. Here’s a picture which shows that Miracle Gro and Gravel tied as the the best medium for rooting plants. It’s hard to tell from the pictures, but Gravel had 5 flower buds and Miracle Gro had twenty. Gravel also was a bit bushier with larger leaves. Miracle Gro was definitely taller, but was less filled out and had smaller leaves. Gravel also had a lot more roots coming out the bottom. These are the same plants planted at the same time. Either one would do well for rooting cuttings. Perlite – Fertilome w/o fertilizer – Charcoal – Gravel – Miracle Gro. Rooting Plants versus Collecting Seeds. Why root plants? Why not just collect their seed? That was a question posed to me and here’s the answer. When you root a plant, you are getting the exact same plant over and over. There is no deviation. When you collect seeds and then start new plants, you’re never quite sure what you’re going to get. That’s not necessarily a bad thing, because you are adding some biodiversity, but you are not going to get exactly the same plant. In actuality I do both – root plants and collect seeds plus I divide plants in the spring. Every year as fall approaches, I’m looking to keep the strong plants and get rid of the weak plants. I collect seed only from strong and vigorous plants which have characteristics that I like. You’re never quite sure how they are going to turn out, but you know they come from good parents so that’s a plus. I also literally pull out diseased plants or plants that are just not doing well. You don’t want to encourage those characteristics. I have some plants that have bad mildew while other plants of the same species don’t have it nearly as bad. I’ll collect the seed from the non-mildew plants. Lantana is quickly becoming my favorite nectar plant. I have a couple of plants that have been growing now for 3 years in a row and they’re doing great. They have even dropped seedlings, so I have many more lantana plants in my garden. 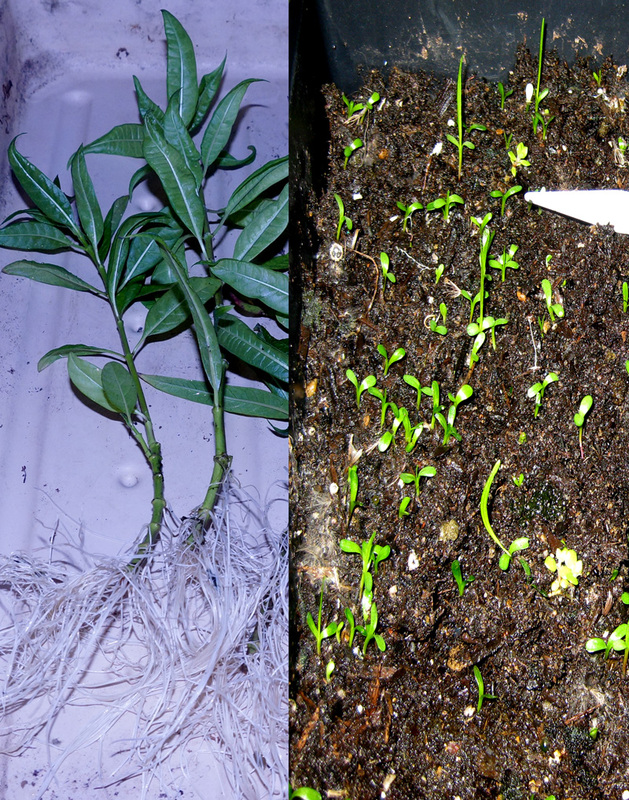 The problem is that most of the seedlings don’t look as nice as the parents. They are tall and spindly and not quite as colorful. They do however seem to do well in less sun, so that’s a positive. Lantana is the plant I mainly grow from cuttings. I’m also experimenting with a couple of other plants, but don’t expect good results. Some plants are more traditionally grown from root cuttings or by division. That’s another way to get exactly the same plant. I do that with most of my perennials. So the answer is – it’s not an Either/Or proposition. I do both plus I divide plants in the spring. The trick is to know which plants to save seeds and which plants to root. I’ll be doing a separate posting on that topic. If you want to know about a particular plant, let me know and I’ll give you my answer.